The sun doesn’t come up in Bucerias until well after seven in the morning. We’ve adjusted by beginning to sleep in a little bit later in the a.m. Today, we actually didn’t even get out of bed until close to 9:30, but it’s o.k. we really don’t feel like we are being lazy. 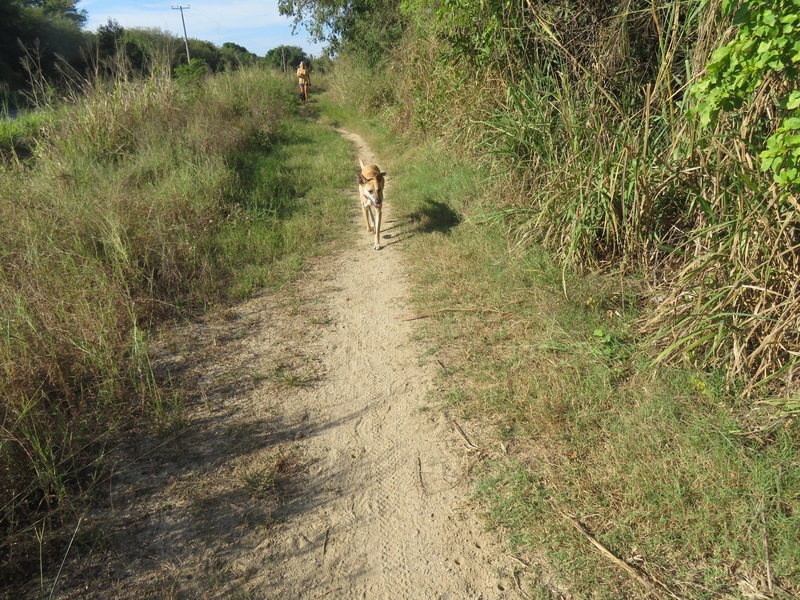 We leashed up the pups and set out on a hike up the road towards the mountains to see what lurks around the bend in the highway. 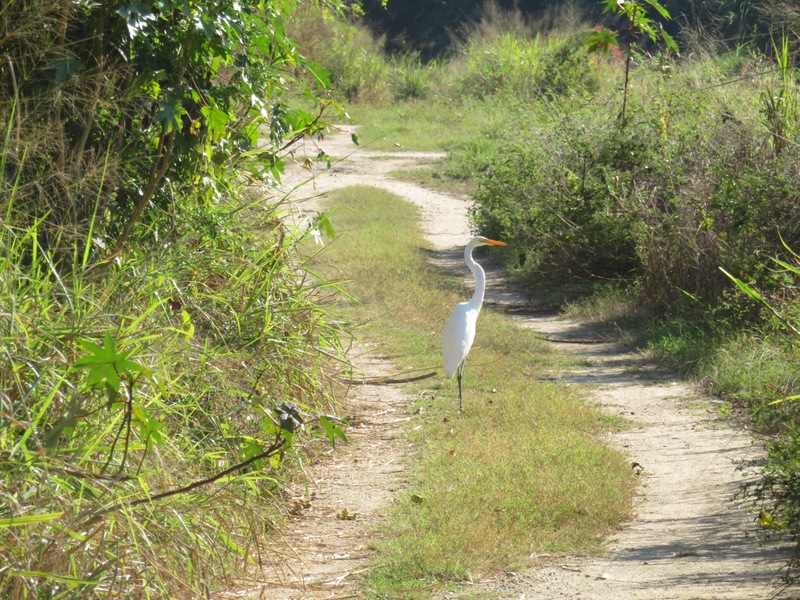 There were lots of colorful birds in the brush along the trail and one large egret in the middle of the path. All the hairs on Cali’s back stood fully erect in an attempt to make herself look bigger. 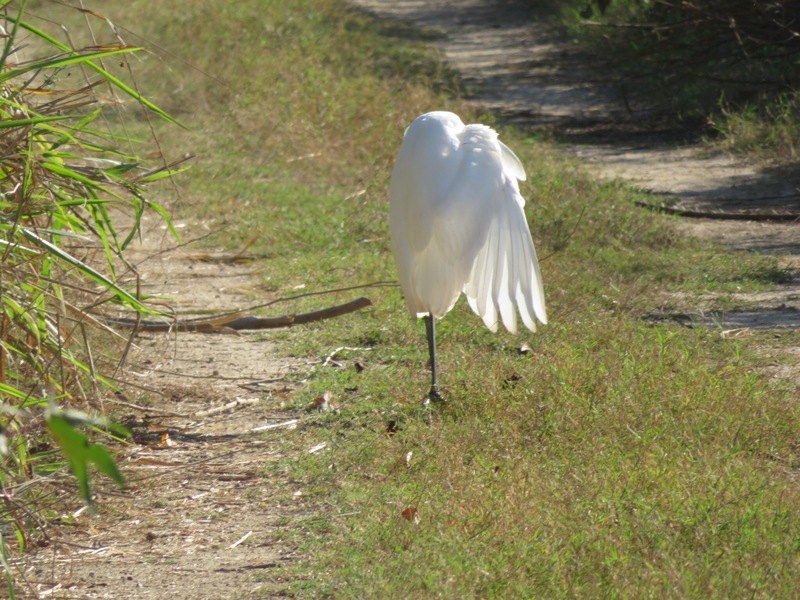 She barked and menaced, not sure how to proceed, but the egret didn’t budge until she started moving towards it. After she realized that it would flee, she was full on brave and she went charging after it when it landed a few yards down the path. We came upon a fancy development behind a giant wall with glass entry doors and a little store out front. This store is much more organized than our backstreet store in the colonia and even offers fruit and vegetables. Curious about rental prices, I asked the storekeep, but nobody knew anything for certain. We bought a few bananas and apples then walked back to the compound and had a cup of tea. The cleaning crew was getting the casita two doors down all buffed out for the new tenants that will arrive this afternoon. Lupita came over to clean our place, so we gathered up our swimming gear and walked over to the pool area. We sat in the restaurant and had some lunch. Beautiful afternoon with weather in the mid eighties. Sunday’s always draw a number of people to check out the live music and have a swim. Lupe, the owner came down and made sure everyone was content. She has created quite an oasis for herself here. 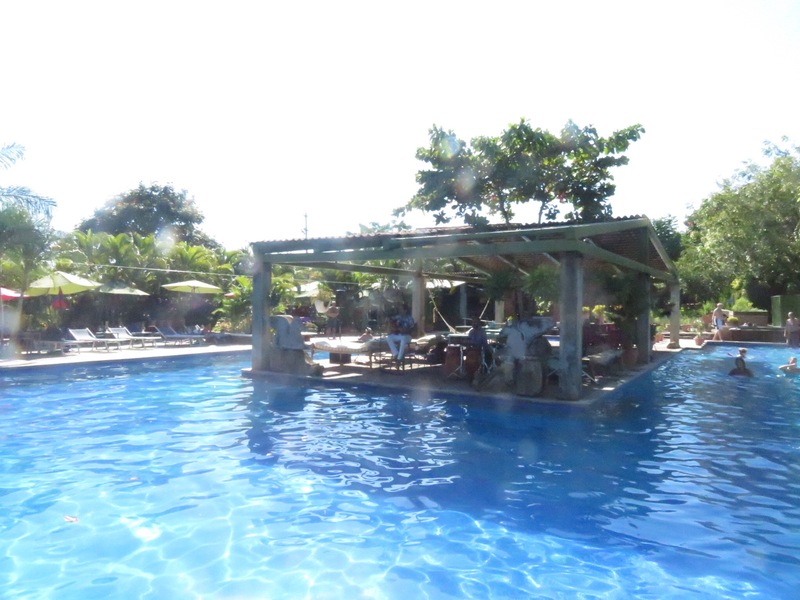 All of the buildings, pool, botanical gardens and the total essence of Los Arroyos Verdes was born of her dream and she designed it and saw it through to completion. 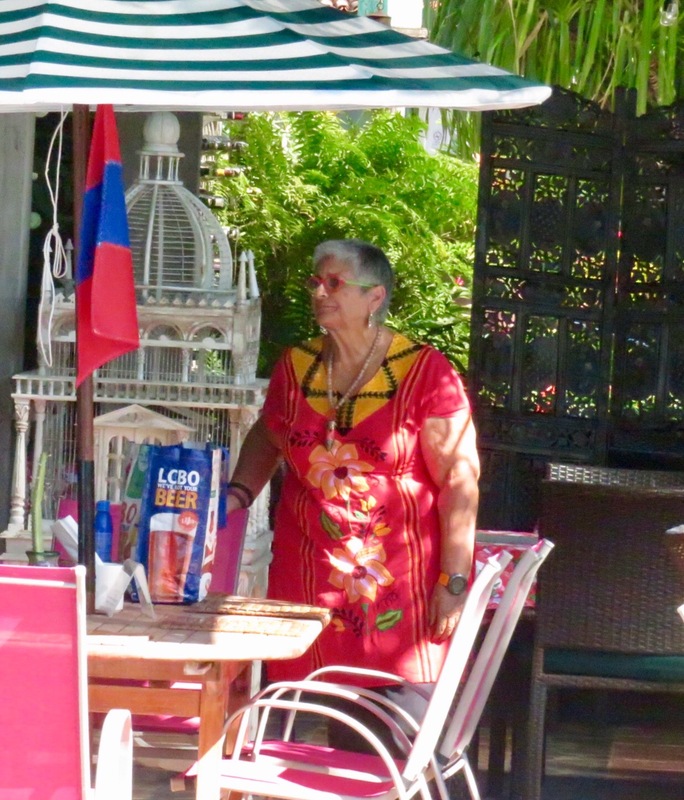 There is an atmosphere of peace and serenity that she cultivates for the eclectic group of residents and visitors that make Los Arroyos their home. The spa girls were on the lawn next to the pool giving free chair massages, so I got my ten minutes then changed into my trunks and hopped into the pool. PJ went to put her leftover pizza in the room and the band began setting up on the island in the middle of the pool. 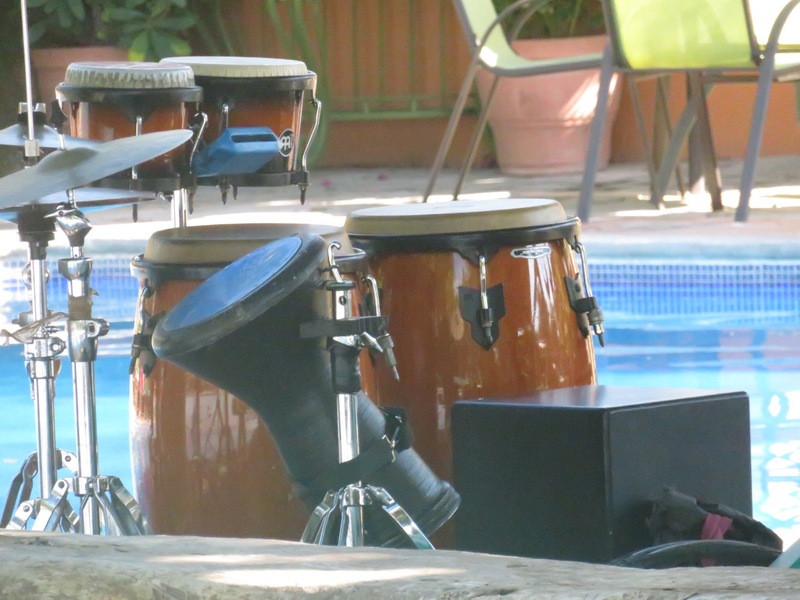 A guy on congas and a guitarist, locals from Bucerias. 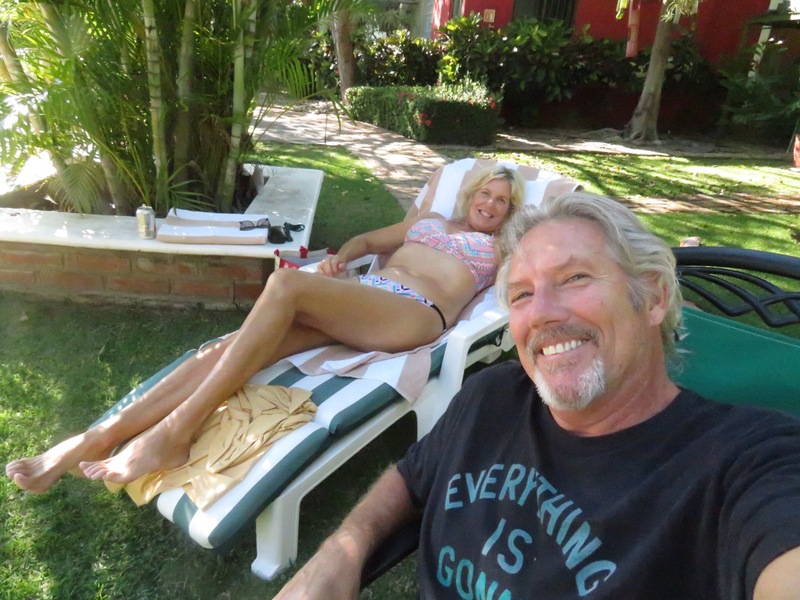 After swimming, I stretched out on a chaise lounge on the grass and read my book while listening to the musicians do their thing. PJ had a magazine and we lounged away the afternoon, alternating between the sun, the shade and the water. 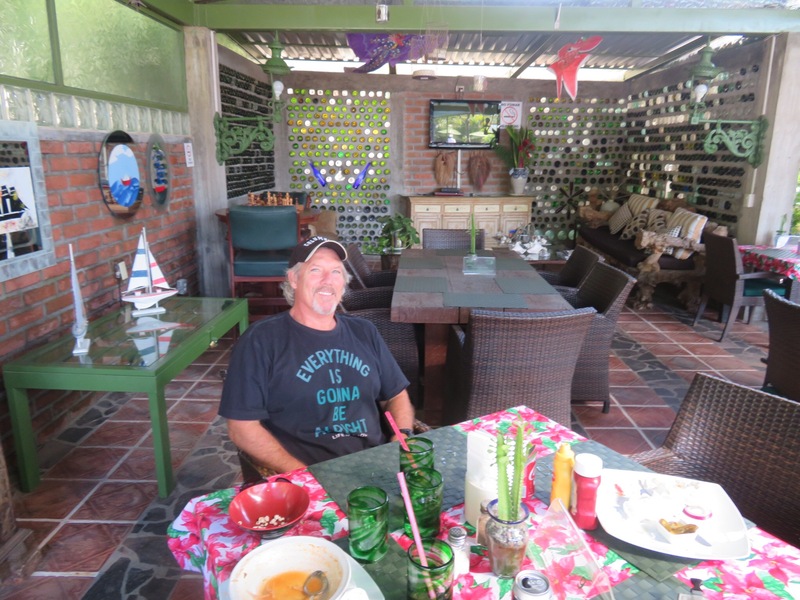 Juan, the kid who variously works as gardener, maintenance guy and today, waiter likes to work on his English with PJ and helping her with Spanish. The idea is for each to speak to the other in the other person’s language. Not always completely intelligible, but always fun. In the evening we relaxed in the pad having a light dinner of fruit and leftover pizza. The new neighbors showed up and put their stuff in the casita then disappeared for a while. A thirty something couple with a young child. 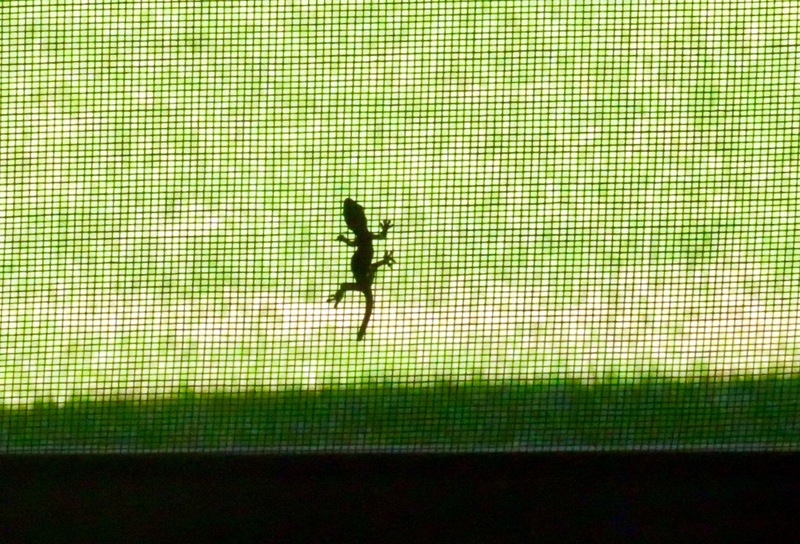 They came back with some friends and are partying on the patio. Seems they came to connect with some people who are staying here also. Lots of chair scraping and jocularity. I was looking forward to having neighbors, maybe be careful what you wish for. We’ll see what they’re about tomorrow. Our main concern is our internet. It’s been coming and going for several days now and is mostly just gone. Eduardo is bringing in the experts tomorrow so hopefully we can post. My phone’s hot spot was doing good up until tonight and it’s acting up too. Maybe a sign to get offline a bit more. Really enjoyable Sunday here at the gardens. PJ is starting to pack things up to go home Tuesday and I’m reading and writing with the dogs.